"BIDS Research ALMANAC was held on 11-12 November 2018 at Lakeshore Hotel in Dhaka. The aim of this annual flagship event of BIDS is to provide an opportunity to highlight new research ideas and findings and to undergo public scrutiny of BIDS work. Spread over a total of five technical sessions, this year’s ALMANAC had 17 papers by BIDS researchers covering a wide range of subjects, including Agriculture and Employment,SME Productivity, Financing and Women Entrepreneurs, Quality of Growth and Human Development, Urbanization, Disaster Vulnerability and Social Safety Nets, and Energy Use, Migration and Household Welfare. Dr. Mashiur Rahman, Economic Affairs Adviser to the Hon’ble Prime Minister, Government of the People’s Republic of Bangladesh, inaugurated the event as the Chief Guest and Begum Kajal Islam, Additional Secretary, Planning Division was present as the Special Guest. Dr. K A S Murshid, Director General of BIDS chaired the session. The concluding session titled “The Development Outlook - Key Messages for the Next Government” was chaired by Dr. Mohammed Farashuddin, Former Governor, Bangladesh Bank. 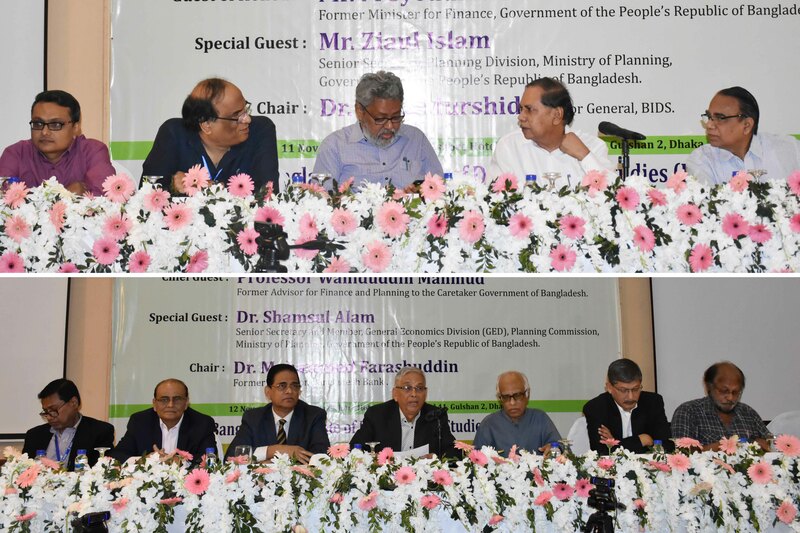 Professor Wahiduddin Mahmud, Former Adviser for Finance and Planning to the Caretaker Government of Bangladesh, graced the event as Chief Guest. The distinguished panelists of the session included Dr. Zaidi Sattar, Chairman, Policy Research Institute (PRI), Dr. M A Taslim, Professor, Department of Economics, University of Dhaka, Dr. Mohammad Tareque, Director, Bangladesh Institute of Governance and Management (BIGM), Dr. Zahid Hussain, Lead Economist, World Bank and Professor Shapan Adnan, National University of Singapore." The presentations and videos of the program are available below. Paper 2: Why do Bangladeshi Cattle yield High Positive Returns? Paper 3. Disaster Impacts: Are these "an equal opportunity menace" to Development?